The Selmer family traces its roots back to the 18th century rural Alsace-Lorraine region of France with Johannes Jacobus Zelmer. Enlisting in the French army provided a means of moving families from the country to the city. For three generations Zelmer men served in the same regiment, while the boys, too young to be soldiers, played in the band. Jean-Jacques Selmer (son of Johannes Jacobus), in addition to changing the spelling of the family name, ascended to the rank of drum major. The military afforded great opportunities for education and travel. When Charles-Frederic Selmer (son of Jean-Jacques) died in 1878 he left sixteen children, five surviving to adulthood. Of these, Henri and Alexandre graduated from the Paris conservatory as accomplished clarinetists. Henri went on to perform in the famed Garde Republicaine band and the Comic Opera. By the early 1900s Henri had opened shop in the center of Paris to meet the demand for his handmade reeds and mouthpieces. Soon repair work and customizing led to the manufacturing of clarinets. (I visited this fascinating shop many times, and in fact went to lunch with Jean Selmer in Mantes, where they made the horns,(in that fancy Citroen , the one where you could raise the suspension from inside the car, should you have a flat tire). From 1895 to 1910, Alexandre Selmer served as principal clarinetist with the Boston Symphony Orchestra, Cincinnati Symphony Orchestra, and the New York Philharmonic Orchestra. At the turn of the century, a small retail store was opened in New York City for selling the family wares. Selmer clarinets prospered after winning a gold medal at the Saint Louis exposition of the 1904 World’s Fair. In 1918 Alexandre returned to Paris to assist Henri in their growing family business, leaving an employee, George Bundy, the rights to distribute Selmer products in the United States. Having a firm hold on the professional clarinet market, Bundy next set his sights on flutes. In 1920 Bundy hired George W. Haynes, the first in a family famous for flute making, to design the Selmer flute. These fine instruments bore the brand names “Original Haynes” and “Master Flute”. In fact, Selmer flute manufacturing was briefly moved to Boston, site of several famous flute companies, both Haynes and Powell. Louis Lot flutes became quite popular with professionals in the late 1920s. Selmer responded by offering a copy of a Louis Lot owned by Charles Selmer (first flutist with the Opera Comique and the Concerts Colonne Orchestras). 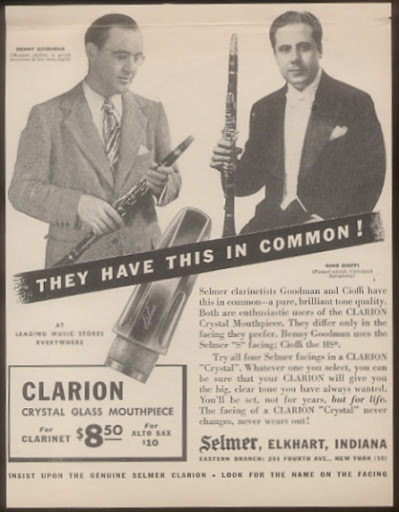 To cement Selmer’s position in flutes, Bundy brought a young flute craftsman named Kurt Gemeinhardt to the United States from Markneukirchen, Germany. Bundy recognized the need to leave New York City in order to expand his manufacturing operations. By the 1920s Elkhart, Indiana, had established a reputation as the band instrument capital. Drawing on a skilled labor pool, the company was moved to Elkhart. A New York showroom remained open until 1951. American industry in the 1940s prospered from advancements in efficient and economical production methods and the newly developed field of plastics. Selmer combined these factors in 1948 to produce one of the first commercially successful molded clarinets–the Bundy Resonite® model 1400. The 1400 was patterned after the famous Selmer (Paris) BT clarinet, used by such great artists as Benny Goodman. The Bundy Resonite clarinet launched a revolution in affordable, high quality musical instruments and established Selmer as an industry leader. The 1400 passed the one million-units-sold milestone in 1978 and continued to launch musical careers. Hope this is interesting to clarinetists and officiandos. "The Selmer Company encompasses the greatest names in musical instruments--Selmer and Bach wind instruments, Ludwig and Musser percussion instruments, Glaesel and Lewis string instruments. Always committed to serving the needs of students, music educators, amateurs, and professionals, The Selmer Company has grown steadily over the years, becoming the industry leader recognized for craftsmanship and quality." Founded early in the 20th century to import and distribute European-made clarinets, The Selmer Company, Inc. has expanded via acquisition to become America's largest manufacturer of musical instruments. It claims a 42 percent share of the U.S. professional band instrument market and 25 percent of beginner instrument sales. The company's woodwind, brass, percussion, and stringed instruments are largely hand-crafted at plants in Indiana, North Carolina, Ohio and Illinois, and sold via more than 1,600 independent dealers. Over three-fourths of the music mammoth's unit sales are made to student musicians, but professional and advanced instruments generate 47 percent of revenues. The company hoped to increase its penetration of international markets--which contributed less than 20 percent of total revenues in 1995--in the mid- to late-1990s. Selmer and many of its subsidiaries have an interesting trait in common: virtually all were founded in the United States by immigrants. Selmer itself became an acquisition target in the last half of the century, changing ownership four times from 1969 to 1993. Acquired via leveraged buy out by the Los Angeles-based Kirkland Messina, Inc. investment company in the latter year, Selmer became a subsidiary of a newly-formed holding company, Steinway Musical Instruments, Inc., following the investment firm's acquisition of piano-maker Steinway in 1996. The new owners took their company public that year with the sale of a minority stake to raise over $60 million in debt reduction funds. The company traces its name and history to France, where fourth-generation musician Henri Selmer founded an instrument shop in the early 19th century. Trained as a clarinetist at the Paris Conservatory, Henri started out making reeds and mouthpieces as well as repairing clarinets, eventually manufacturing models of his own design. By 1920, Henri had diversified into the manufacture of double reed instruments, including oboes and bassoons. Meanwhile his brother Alexandre, also educated at the Paris Conservatory, had moved to the United States, where he played clarinet with orchestras in New York, Boston and Cincinnati. In 1902 Alexandre began selling his brother's clarinets in New York, where the award-winning instruments caught on quickly among professional musicians. With business on both sides of the Atlantic growing fast, Alexandre sought to return to his homeland. He sold the rights to distribute Selmer instruments in the United States to an employee, George Bundy, in 1918. Although the two businesses would develop separately over the course of the 20th century, the American firm would continue to distribute instruments manufactured by its French sister company through the 1990s. Bundy maintained his leadership of the company until his death in 1951. The remainder of this essay will focus on his U.S.-based enterprise. Like his predecessors in France, George Bundy began to diversify into other wind instruments just a few years after Alexandre Selmer's departure. Bundy hired flute designer George W. Haynes in 1920 and brought German flute designer Kurt Gemeinhardt on board later in the decade. Bundy launched Selmer's first saxophone in 1921 and was soon "out-saxing" the instrument's inventor, Adolphe Sax. Selmer purchased the innovator's business in 1928, thereby adding trombones and trumpets to Selmer's repertoire as well as augmenting its saxophone business. While Selmer maintained a strong presence in the market for professional instruments, it also developed an emphasis on student musicians and music education programs. This strategy forged a strong link between Selmer's prosperity and general demographic trends. The instrument-maker's sales rose and fell in concert with the birth rate, albeit with a 10- to 11-year lag. Most student instruments are purchased when children are entering middle school band programs. Inspired perhaps by wartime shortages and consequent increases in raw materials prices, Selmer drew on some of the new materials and manufacturing methods developed during World War II to develop what the company characterizes as "one of the first commercially successful molded clarinets--the Bundy Resonite model 1400." The new instrument offered student clarinetists quality and durability at a comparatively low price. By 1978, the company had sold over one million Resonites. Selmer quickened its pace of growth through acquisition to capitalize on the postwar era's baby boomers, who began to reach prime music education years in the 1960s. Like the parent company, many of these new subsidiaries enjoyed interesting histories of their own. Selmer's first major purchase, the Vincent Bach Corporation, came in 1961. This manufacturer of brass instruments was founded in 1918 by a Viennese immigrant born Vincent Schrotenbach. Schrotenbach had earned a degree in engineering in Germany, but decided to pursue a career in entertainment. After playing the trumpet in Europe, he abbreviated his name and moved to New York City during World War I. From 1914 to 1918, he advanced from the vaudeville circuit to first chair at the Metropolitan Opera House and the Boston Symphony. Company legend has it that Bach was on tour when a Pittsburgh repairman rendered his mouthpiece unusable. The mouthpiece is a small, but vital part of many brass instruments whose shape can be changed to suit different styles of music. Orchestral players, for example, often select a broader and deeper mouthpiece than their counterparts in jazz and dance bands. Bach had a tough time finding a spare. His misfortune not only revealed a market niche, but also gave the musician an opportunity to dust off his "engineer's cap." Upon his return to New York, Bach started repairing and manufacturing mouthpieces himself, while continuing to supplement his income by performing. It was not long before word of his mouthpieces got around musicians' circles, and soon the parts were so prized that they commanded prices of over 30 times those of competitors. Bach started making trumpets in 1924 and added trombones to his line in 1928. At the age of 71, Bach sold his company to Selmer. Production was moved from New York to Elkhart four years later. Two years after moving the Bach operations from New York to Elkhart, Selmer acquired the Buescher Band Instrument Company. Brilhard mouthpieces were added in 1966 followed closely by Lesher double reed instruments in 1967. Selmer was itself acquired by Magnavox Co. in 1969, launching a long and sometimes difficult period of corporate change. In the late 1970s, Magnavox sold Selmer to North American Philips Corporation. In addition to these corporate machinations, Selmer also struggled to meet industrywide challenges. Writing for Forbes magazine in 1983, Laura Saunders cited demographics as a key factor in the musical instrument industry's problems, noting that the birth rate declined by nearly one-third from 1965 to 1975. The resulting decline in school-age children decimated the industry's core market. At the same time, high interest rates and rising raw materials costs accelerated the decline of the market. Competition, both from other leisure and entertainment categories and from foreign manufacturers, whittled away at domestic producers' sales and profitability. Selmer's own opportunistic acquisitions continued, albeit at a slower pace, during this period. The company acquired Cleveland-based Glaesel String Instrument Service, an assembler and distributor of student violins, in 1978. Selmer also diversified into an entirely different area of the stringed instrument category, electric guitars and amplifiers, during the 1970s, but divested these holdings in 1980 to concentrate on the more classical instruments. Selmer added a rhythm section to its group with the 1981 acquisition of the Ludwig Drum Company. Founded by German immigrant brothers William and Theo Ludwig in 1910, the firm started out manufacturing an improved bass drum pedal. After years of experimentation, the company expanded into the manufacture of timpani drums--a specialty of William's--in 1916. The Ludwigs sold their firm to Elkhart's C.G. Conn Company during the Great Depression, but William bought it back (along with its sister subsidiary, Leedy Manufacturing Company) in 1955. Ludwig added the Musser Marimba Company's xylophones, chimes, bells, and other mallet instruments to its offerings in 1966. In 1988, Selmer again changed hands, this time to a New York-based realty firm, Integrated Resources Inc. Unfortunately, the new parent sought bankruptcy protection within a year of the acquisition. Integrated's insolvency didn't reflect well on Selmer, whose sales slid seven percent, from $86 million in 1989 to $80 million in 1990. After years of corporate limbo, the bankruptcy court in charge of Integrated's case put Selmer on the auction block in 1993. That is when two Los Angeles-based financiers named Kyle Kirkland and Dana Messina put together a financing package and acquired the company in a $95 million leveraged buy out. The new owners left Selmer's management team, including president and chief executive officer Thomas Burzycki, in place, and maintained its operations in the Midwest. Under new corporate ownership Selmer bounced back slowly in the recessionary market of the early 1990s, with sales recovering to $85.9 million by 1992 and net income amounting to $2.3 million. Notwithstanding its high debt load, which Forbes's Bruce Upjohn estimated at $160 million in 1995, Selmer continued to add musical instrument manufacturers to its "band" in the 1990s. The 1995 acquisition of Chicago-based William Lewis & Son, a 121-year-old violin concern, helped push sales to $189.3 million that year. Selmer (or more correctly, its parent, the Kirkland Messina, Inc. investment firm) completed its largest acquisition to date in 1996, when it purchased Steinway Musical Instruments from another group of investors for $101.5 million. Selmer had attempted a diversification into piano manufacture decades before with the purchase of Jesse French Co. in the 1940s, but shuttered the operation in 1954. Soon after the Steinway acquisition, Kirkland and Messina created a new holding company, Steinway Musical Instruments, Inc., with Selmer and Steinway as distinct subsidiaries. Kirkland serves the new entity as chairman, while Messina acts as CEO. In their mid-30s, both were the youngest members of the board of directors. With over $230 million in combined sales, the new company was the largest player in its industry. In 1996, the investment firm took Selmer Musical Instruments public with an offering of about 16 percent of its equity on the New York Stock Exchange. The more than $60 million they expected to raise would be used to reduce a heavy load of LBO debt. According to the company's August 1996 prospectus, management hoped to increase Selmer's production capacity to meet rising demand; continue its acquisition strategy; increase overseas sales, especially in Europe; and increase efficiency. Principal Subsidiaries:Vincent Bach International, Ltd. (United Kingdom). Principal Divisions:Selmer Division; Ludwig/Musser Division; Glaesel/William Lewis Division. Anslinger, Patricia L., and Copeland, Thomas E., "Growth through Acquisitions: A Fresh Look," Harvard Business Review, January-February 1996, pp. 126-35. Cook, Daniel D., "The Beat Slackens for a Mature Industry," Industry Week, May 14, 1979, pp. 144-50. Halbfinger, David M., "Steinway Is Sold to Big Producer of Instruments," Newsday, April 19, 1995, p. A41. Koprowski, Gene, "Selmer Places Percussion Unit on Sales Block; Wants Focus Shifted to Other Instruments," Metalworking News, April 17, 1989, pp. 5-6. Musical Instrument Makers Face Three Challenges," Industry Week, September 20, 1976, p. 130. Saunders, Laura, "Mood Indigo," Forbes, August 29, 1983, pp. 50-52. Selmer: Great Names in Music, Elkhart, Ind. : The Selmer Company, Inc., 1996. Upjohn, Bruce, "The Sweet Sound of Leverage," Forbes, November 20, 1995, pp. 47-48. 1955 ad, also attached below.